Sabbath Walk: Over The Head? One common phrase I have heard over the years is the phrase, "over my head." Usually applied to situations in which the message cannot be understood, or too difficult for normal comprehension. Whether it is a professor at a University who used complex words to describe normal situations, or a pastor preaching something that is too difficult for the layperson to grasp, whenever there is a disconnect between the communicator and the recipient, these three words said it all: "Over the Head." The next step is usually this: Forget it. Move on. Next item on the agenda. Maybe, lunch. I really hope that will not be the end of the matter. I hope people would take time to ponder about whatever little they have heard. I hope they would ask around to see if anyone attending the same sermon or talk would have learned something. For to find ways to understand is the spirit of the Bereans at work. The Bible notes how eager the Bereans were to learn. The Greek word for "disciple" is "mathetes" which also means "learner." Disciples are learners. Learning is a really good word. It represents an openness to be taught. It requires the humility to listen. It is a characteristic that prepares one to ditch the hat of ignorance for knowledge. Society places lots of attention on schools and educational facilities. Universities are key places of learning and for leadership development. Unfortunately, the modern mindset about learning is essentially about exam results, about high academic scores, about scholarships, about jobs, and about reputation. Where is genuine learning? The god of "Economic Utility" basically sees education as the means to a good job. Thus, everything is invested for the purpose of gaining employment. It falsely tells the student that as long as he studies hard, gets the good results, obtain the best degrees, he will have a good job waiting for him. The reality of life is that having a good education does not necessarily translate into jobs. Anyone who buys into the god of "Economic Utility" will look back at his education and regrets it as a waste of money. Even then, I often hear of people telling me that whatever they learned in University are useless and non-applicable for their work. If that is the case, why go to University? Why study? It creates a mockery of our University systems. The god of "Consumership" is a way to express "he who has the most toys, wins." Students with this mentality will accumulate knowledge for the sake of accumulating. He who knows more will win. 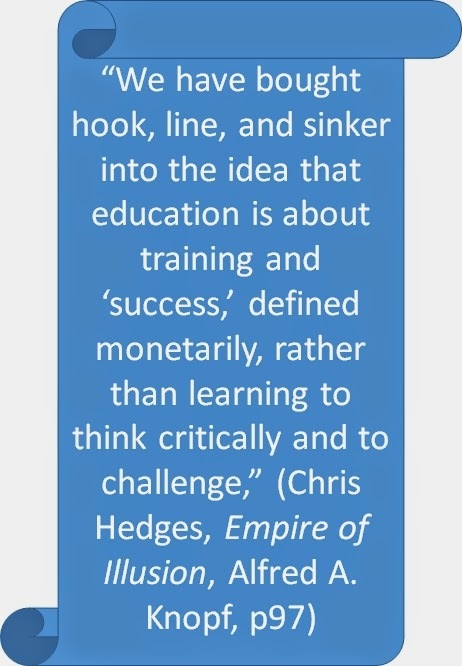 Learning is about knowledge hoarding rather than growing as a person. Remember the warning in Ecclesiastes? The god of "Technology" is something that is a growing challenge that displaces teachers and schools. With the rise of online learning and technological advancements, I am hearing more people justifying the need NOT to go to school at all. After all, if all the learning can be done at home, what's the point of going to school? If Google can provide all the answers, why have a teacher or a tutor? If one can use search engines to diagnose one's health, why see a doctor? If one can watch Youtube videos to learn how to cook, why go to culinary school? If one can learn a foreign language by downloading online materials, why bother to go to language schools? The list goes on. The trouble with such a thinking is, what about community? Is education about content alone? Where is the environment to enable iron sharpening iron? The god of "Multiculturalism" is something that Postman was careful not to be misunderstood. It is not about being insensitive to cultural differences. It is the usage of culturalism or tribalism matters block the path to free learning. Imagine a diverse classroom of different races. Is the school going to put in the best teachers REGARDLESS of race? Or are they simply trying to fit in various numbers of teachers from different races regardless of their competence? At the crux of Postman's argument is that education should be about "how to make a life, not how to make a living." That ought to be the purpose and objective of education. Three things can be learned from the Bereans' attitude to learning. First, they are led by a "noble-minded" posture. This posture is essentially an open-minded attitude to hear what Paul had to say. With an open-mind, the Bereans are always in a humble learning position, believing that they have something to learn. Luke contrasts the Berean Jews with those from Thessalonica who were closed-minded and were looking to defend their stubborn views. Just look at the difference. The Bereans received Paul's teachings with open-minded willingness to learn. There were objective in their learning. The Thessalonica Jews were closed-minded and were more interested to suppress teachings that were not in line with their own. They not only shut their own ears, they tried to shut others down. They lose sight of the objective of learning but imposed their subjective understanding of the truth. Second, when it comes to Scripture, the Bereans receive the message "with great eagerness." This enthusiasm is a result of a noble heart. People who is dull on the inside will lose interest in anything outside. I wish I can see more Christians in Church listening to sermons with great eagerness, regardless of how difficult it is to follow the message. I know that some preachers do not communicate as well. Rather than to diss them off whenever one cannot understand their message, why not spend time praying over the passage if the message is particularly difficult? Why not take time to ask questions on passages or difficult words? Why not try to find ways to learn at least something rather than absolutely nothing? We may fault the teacher or preacher for their communication style, but we only have ourselves to blame when we do not try to learn with eagerness about the Word. Third, the Bereans "examine the Scriptures every day." Wow. That is classic BSF in the 1st century. Not only are they studying the Scriptures for themselves, they are doing it on a regular basis. Some people only read the Bible on Sundays. Others are haphazard in their Bible reading. Still, I fear that many Christians do not open up their Bibles at all during the week. The Bereans give us a model for faithful and regular Bible reading. If we are truly convicted that the Bible is the Word of God, should we not spend more time on the Word of God? If we truly believe that God is speaking to us through the Word, and that we love God, should we not spend time eagerly exploring, examining, and enjoying the Word of God? Alas! Biblical literacy is on the decline. We may have more Bibles downloaded on our digital devices, but that is no guarantee that people are more Bible literate. 3) What to Do With "Over the Head" Sermons? Adopt the attitude of the Bereans. Some of the most difficult lectures I have ever encountered are those in seminary lectures. I know at least one lecture in which I was clueless at the beginning, clueless at the middle, and equally clueless at the end. What I did remember is the name of the professor. I remember it was some philosophical topic. I remember it was part of a larger program of learning. Most importantly, I learn how not to teach. There is always something to learn. Learning is not a matter of content or substance. It is not only about delivery or communication medium. Learning has to do more with the heart rather than the head. When the heart is willing and humble, there is always something to learn. One can learn in terms of what to do or what NOT to do. One can learn about key words that are unknown and merit some personal research or group discussion. One can use the time to do one's own reflection on the Scripture passage itself. My mother has never had English lessons. She learns it on the job. She once had an interesting experience with an unhappy client who asked her to "Go fly a kite!" Innocent and unaware of what it was, she asks: "Fly what kite?" Strangely, the client's unhappiness gets replaced with laughter. Whatever it is, my mum learned for life what that statement meant. I marvel at her humility to learn despite the negativity thrown at her. She willingly accompany family members to English church services and can make out key words and phrases despite not understanding 100% the message. The desire to learn trumps the ability to comprehend. That is in essence a chip of the Bereans. My friends. May I encourage all of us not to be distracted or discouraged by things or messages that seem to be "over the head." We cannot change the preacher or teacher for how he/she says things. What we can do is to make lemonade out of lemons thrown at us. We need not complain nonstop. We can learn, with the Holy Spirit guiding us, and with a community that we can discuss matters with. One more thing. What is the goal of Christian education? Perhaps, the end of Ecclesiastes can give us a good hint. Fearing God is the motive. Revering God's Word is the way forward. Whenever God's Word is being preached, there is always something to learn. Regardless of whether it is something "over the head" or not. It is the heart that opens up the mind for learning.